If you were looking for a bright side to Apple’s underwhelming updates to its Mac Pro line of tower computers, it would have to be that Apple hasn’t forgotten that it makes such a product. The new Mac Pros released at WWDC 2012 represent a speed bump, plain and simple. The new Mac Pros use the same, highly-upgradable case design, the same graphics cards, and even the same version of USB as the last iteration. And while the Macworld Lab’s test results show the new Mac Pros to be considerably faster than those systems the new Mac Pros replace, it is hard to swallow new “pro” systems that lack Apple’s fastest connection, Thunderbolt, released on MacBook Pros 16 months ago, and USB 3.0 support that arrived on the new MacBook Air and MacBook Pro. The Mac Pros aren’t cheap. The new low-end Mac Pro costs $2499 and comes with a 3.2GHz quad-core Xeon W3565 processor and 6GB of 1066 DDR3 RAM. 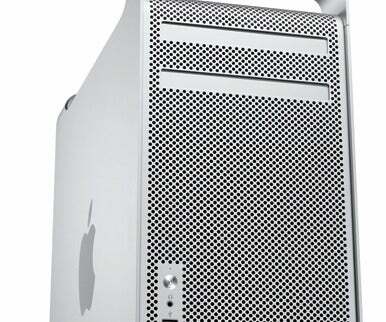 The $3799 Mac Pro has a pair of 6-core 2.4GHz Xeon E5645 processors, and 12GB of 1333 DDR3 RAM. Both systems have 7200-rpm 1TB hard drives and ATI Radeon HD 5770 PCI Express graphics cards with 1GB of video memory. The Mac Pro is still Apple’s most customizable Mac. In an era where the company has begun using proprietary screws to keep casual DIYers from tampering with their own Macs, the Mac Pro has an easy-to-access case with three free hard drive slots, three empty PCI express card slots, and an extra optical bay. It has two gigabit ethernet ports, built-in Wi-Fi, five USB ports, four FireWire 800 ports, two Mini DisplayPort connectors, and a dual-link DVI connector. What the new Mac Pros lack are Thunderbolt, USB 3.0, and new processor technology. Even if new case and motherboard designs weren’t ready for release, it sure would’ve been nice if Apple included Thunderbolt and USB 3.0 connectivity via a PCI express card. Who wants to spend $3800 on a system that begins its working life a year and half behind current technology? The new quad-core 3.2GHz Mac Pro is 16 percent faster overall than the 2010 quad-core 2.8GHz Xeon Mac Pro, which is certainly nothing to sneeze at. The new system is 8 percent faster than the 2010 eight-core 2.4GHz Xeon Mac Pro. Going back further, the new system is 44 percent faster than the 2009 low-end quad-core 2.66GHz Xeon Mac Pro. 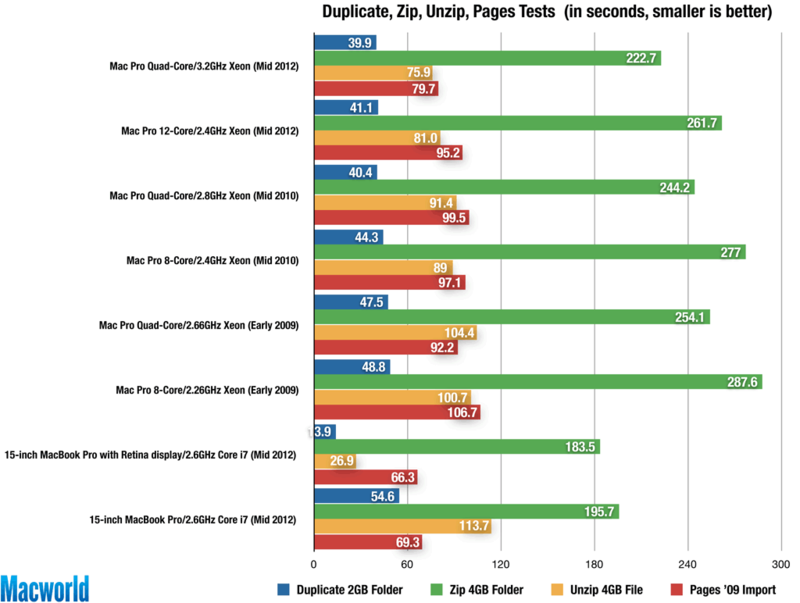 While the file duplication test results are pretty much identical between the new low-end and the 2010 low-end Mac Pro, some tests were considerably faster on the new system, helped by a 14 percent faster processor and twice the RAM. Photoshop, for example, is 31 percent faster than the 2010 quad core model. The new 12-core 2.4GHz Mac Pro is 10 percent faster overall than the 2010 eight-core 2.4GHz Xeon Mac Pro, and 31 percent faster from the 2009 eight-core 2.26GHz Xeon Mac Pro. How We Tested: We duplicated a 2GB file, created a Zip archive in the Finder from the two 2GB files, and then unzipped it. In Pages ’09 we converted and opened a 500-page Microsoft Word document. 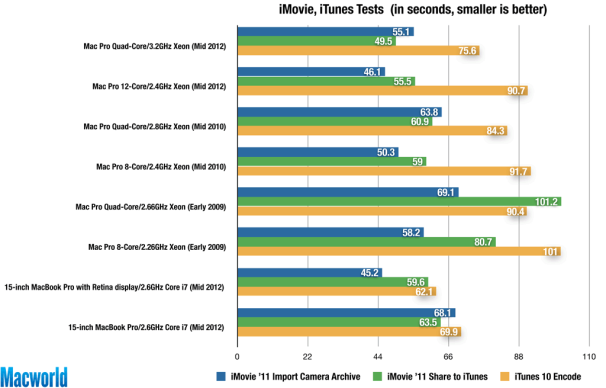 How We Tested: In iMovie ’11, we imported a two-minute clip from a camera archive, and performed a Share Movie to iTunes for Mobile Devices function. In iTunes, we converted 135 minutes of AAC audio files to MP3 using the High Quality setting. As we’ve seen many times in the past, a system having fewer but faster processing cores will outperform (in all but a few of our tests) a system with more cores that run at a slower speed. That holds true with these machines. The new quad-core 3.2GHz Mac Pro is faster than the new 12-core 2.4GHz Mac Pro in 11 of our 16 individual tests, including our iTunes encode test (17 percent faster), Pages import (16 percent faster), iMovie import test (16 percent faster), and our file compression test (15 percent faster). And even though they use the same graphics cards with the same 1GB of video memory, the 3.2GHz quad core Mac Pro is 21 percent faster in our Cinebench OpenGL test and 22 percent faster in our Portal 2 tests. Not surprsingly, the 12-core Mac Pro excels with software that’s designed to take advantage of multiple cores. With 12 cores—and the ability to address 24 virtual cores—the 12-core 2.4GHz Mac Pro is 28 percent faster than the new quad-core 3.2GHz Mac Pro in our Handbrake encode test, 52 percent faster in our Cinebench CPU test, and 81 percent faster in our MathematicaMark 8 test. This isn’t the first 12-core system that Apple has ever shipped. A 2010 12-core 2.66GHz Mac Pro was considered a configure-to-order option in some Apple documents, but showed up as one of three standard configurations on the Apple Store’s Mac Pro page. While that system cost $4999, it outperforms the new $3799 12-core Mac Pro. The 2010 12-core Mac Pro is 7 percent faster in overall performance, 4 percent faster in MathematicaMark, 12 percent faster in our Handbrake encode test, 8 percent faster in the Cinebench CPU test and 13 percent faster in Cinebench’s OpenGL test. 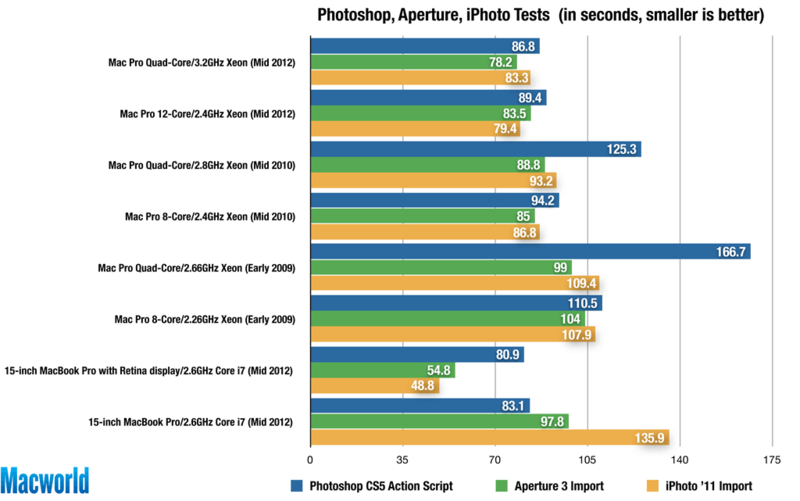 How We Tested: In Photoshop CS5, we ran an action script on a 100MB image file. In Aperture 3 we performed an Import and Process on 207 photos. In iPhoto ’11, we imported 500 photos. Neither Mac Pro models are able to surpass the overall score of the new 2.6GHz Core i7 MacBook Pro with Retina display ( ). 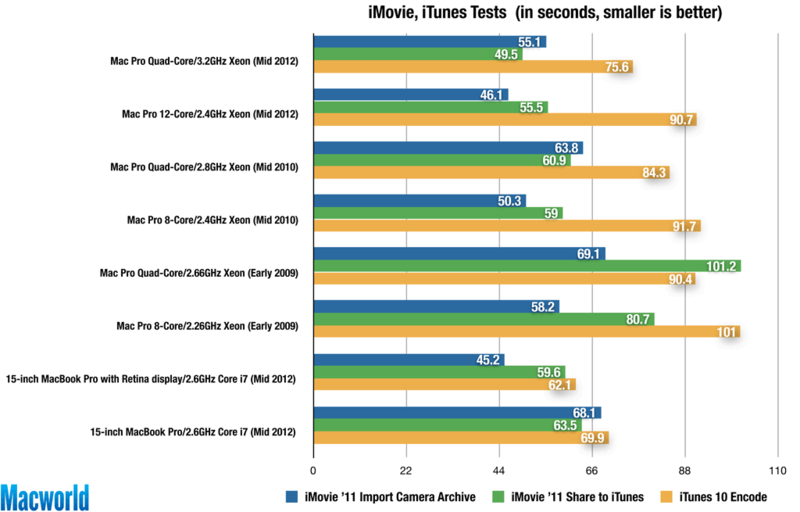 The Retina MacBook Pro is 30 percent faster overall than the new quad-core Mac Pro. The performance from the Retina MacBook Pro’s flash memory crushes the internal hard drive of the Mac Pro; the Retina MacBook Pro completed the file duplication and file unzip test 65 percent faster than the new low-end Mac Pro. 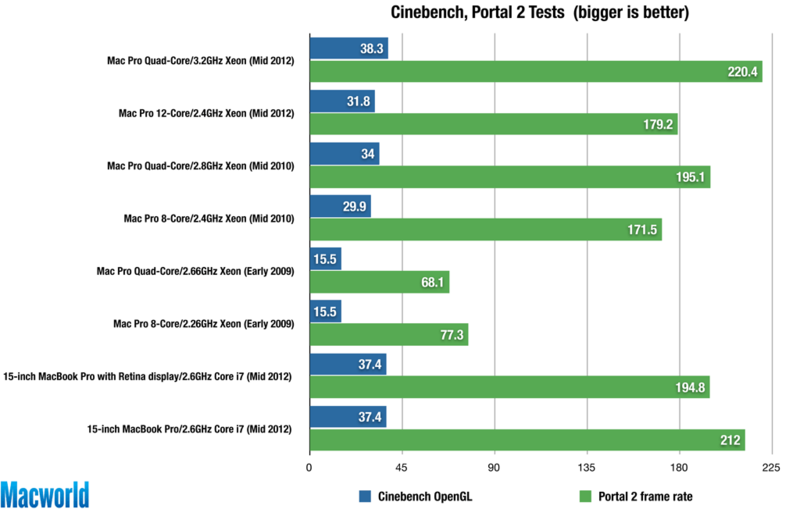 The quad core Mac Pro was faster in just three of our tests: iMovie export (16.9 percent), Portal 2 (11.6 percent), and Cinebench’s OpenGL tests (2.5 percent). 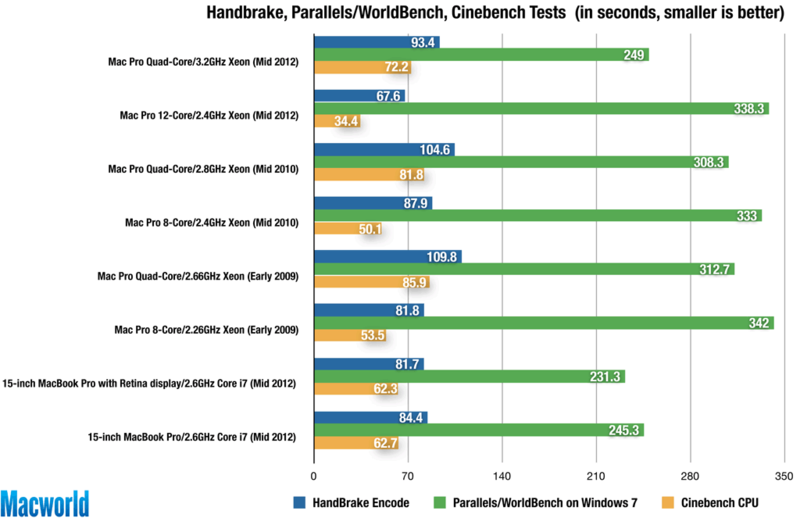 The Retina MacBook Pro is also faster overall than the new 12-core Mac Pro, with a 27 percent higher Speedmark 7 score. Again, faster flash memory and faster (though fewer) processing cores helps the Retina laptop best the 12-core Mac Pro in all but our three most processor-intensive tasks: Cinebench CPU, MathematicaMark 8, and Handbrake. The Retina MacBook Pro is light on expandability and connectors, so if you want a fast system with FireWire 800, Thunderbolt, USB 3.0, an optical drive and built-in gigabit ethernet, the new non-retina MacBook Pro might be a better bet. The new quad-core and 12-core Mac Pros were 6 and 8 percent faster, respectively, than the $2199 non-Retina 2.6GHz Core i7 15-inch MacBook Pro—the quad core Mac Pro bests the MacBook Pro in eight of the 16 individual tests, and the 12-core tops the laptop in nine of the 16 tests. The 7200 rpm hard drives in the Mac Pros are about 25 percent faster than the 5400 rpm drive in the 15-inch MacBook Pro. If you need to have multiple internal hard drives or PCI-Express cards for your video or audio workstation, the Mac Pro is without a doubt the most configurable Mac available. If your workflow includes one of the few applications that can take full advantage of 12 cores, then the speed increase may warrant spending the extra cash for a Mac Pro. But even for most power users, a new non-retina display MacBook Pro with its full complement of up-to-date connection types, may offer a better mix of upgradability, connection flexibility and processing power.